17-year-old Erik Jones stands with is crew in victorty lane at Five Flag Speedway in Pensacola, Fla. after Chase Elliott was disqualified in post-race tech. The annual Snowball Derby at Five Flags Speedway in Pensacola, Fla. is one of the most prestigious late-model races in the country. With a list of past winners which includes the likes of Donnie Allison, Darrell Waltrip and Kyle Busch, the Snowball Derby is always one of the most competitive short track races of the year. 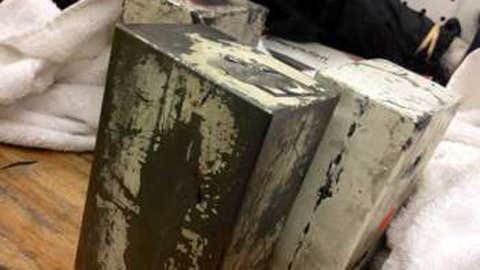 The illegal tungsten ballast discovered in Chase Elliott’s Snowball Derby car. This year’s action was no different, but the real drama began to unfold after the checkered flag flew. NASCAR Camping World Truck Series regular Chase Elliott dominated the race, leading 233 of the 300 laps to score his second Snowball Derby win in three years. However, Speed51.com reported track officials discovered the presence of tungsten ballast in the frame of the car during post-race technical inspection. Clearly a violation of the Snowball Derby rule book, Elliott was disqualified and the win was given to second-place finisher Erik Jones. The decision gave Jones his second-consecutive Snowball Derby win, becoming only the third driver in the race’s 46-year history to win back-to-back races. Both young up-and-coming drivers with a bright NASCAR future ahead of them, the announcement sent many to Twitter to congratulate Jones and offer advice to Elliott. Simply sorry to everyone. One Mistake on our part costed us the race. I Can't thank the ones who are still supporting us tonight enough. 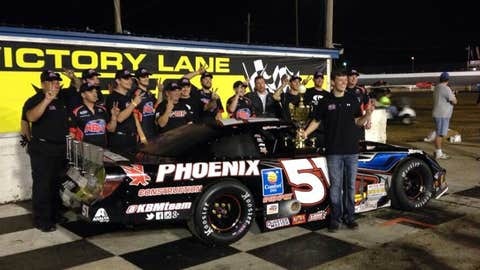 It's official @KBMteam car passes tech making @erik_jones your #SnowballDerby winner!!! @chaseelliott keep your head up! Everyone knows the talent that you have. Want everyone to understand that the performance of @chaseelliott tonight was not enhanced by a piece of tungsten, rule is for cost! The coolest part about tonight will be lookin back on it years from now when Erik & Chase are having the same battle for a Cup Championship. @AllWaltrip I'm with you on this one DW. While the debate continues to rage whether the tungsten ballast found provided Elliott with a clear advantage in Sunday’s race, there’s no arguing the fact tungsten is against the rules. In essence, tungsten is outlawed as a cost-cutting measure for teams competing on the short-track circuits. A piece of tungsten ballast is much more expensive than a piece of lead ballast of the same size. As Diandra Leslie-Pelecky points out on BuildingSpeed.org, the reasoning for the extreme price difference has to do with the rarity and difficulty of processing tungsten. If you remember, this is not the first time Elliott entered victory lane amid controversy. The 17-year-old son of Bill Elliott scored his first career NASCAR Camping World Truck Series race after making hard contact with Ty Dillon battling for the win at Canadian Tire Motorsports Park. In November, Jones became the youngest winner in NASCAR history after scoring the NCWTS victory for Kyle Busch Motorsports at Phoenix International Raceway. Elliott and Jones were not the only NASCAR drivers entered in the historic event, however. Matt Kenseth’s son Ross finished eighth, while Landon Cassill was 11th, former NCWTS winner Cale Gale was 14th, NASCAR Nationwide Series driver and former Snowball Derby winner Johanna Long was 16th, while Sprint Cup Series regular David Ragan was 28th.